Yesterday when may went through the list of possibles and she mentioned no brexit there was a massive cheer in the house. All those MPs who campaigned for and won their seat on the back of backing/respecting the referendum. All those MPs who campaigned for and won their seat on the back of backing/respecting the referendum. I think it was all those MPs who represent Remain majority constituencies. Not including former Brexit Secretary Dominic Raab of course (Esher and Walton 58.4% Remain), Theresa Villiers, former NI secretary (Chipping Barnet 58.9% Remain) etc etc. All continuously voting against the wishes of their constituents. Don't know why they bothered with the first referendum MP's never had any intention of leaving the EU what ever the result. Might as well not have any more elections, referendums, just leave to the MP's and the old boy/girls network and stop pretending we live in a democracy. We had a civil war 400 odd years ago made no difference then and this has made no difference now still run by the old boy network and the secret handshake brigade. Don't 401 out of 632 MP's, that's 63%, represent constituencys that voted Leave? Didn't realise it was a numbers thing. Thought it was about individual responsibility. OK if it's about numbers, May had her deal rejected (again) by 391 (62%) votes to 242. So without any further changes being agreed with the EU, why are they being asked to vote again? So why critisise Dominic Raab and Theresa Villiers for voting contrary to the majority of their constituents then? Um because they also voted against their wishes. You Leavers seem to think responsibility only works in one direction. Um because they also voted against their wishes. Defeated? Labour just picking their moment Anyway, no Brexit on 29th March. End of June at least, so plenty of time for things to change. What you Leavers must remember, is that the only 'deal' that might be passed by Parliament is the transition arrangements. The interim position, which is basically that everything stays the same. Same Customs Union, Single Market, free movement, payments to the EU etc That's for the next 2 years at least while the UK negotiates a full long term relationship with the EU. The EU won't be easy to deal with. May will want a close relationship, and we could easily end up very close, like Norway. Still paying in, still following rules. The majority of the voters and the constituencys are Leave, but Parliament is overwhelmingly Remain. Exactly, delays because of weak willed politicians just makes our eventual leaving even more pleasing. 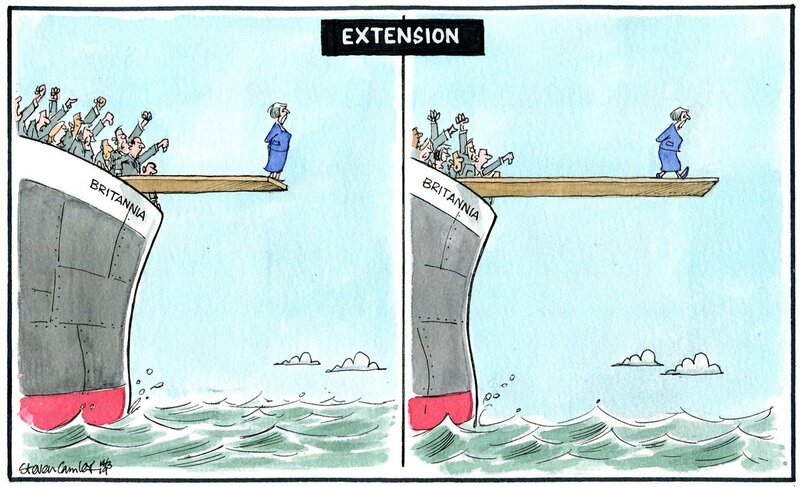 Stephen Barclay, the current Brexit Secretary made the government's case for an extension beyond 29th March yesterday, then voted against it. What the foc is going on?